Today I’m thrilled to tell you that I have an amazing giveaway for you courtesy of lots of wonderful online and high street stores. As some of you will know, the blog recently won the Cosmopolitan Best Interiors Blog award, of which I’m immensely proud so as a thank you to those of you who voted for and supported me I thought it would be lovely to run this bumper giveaway. I’ve been working hard over the last month gathering prizes and donations together and I’m finally ready to announce that the giveaway is live. 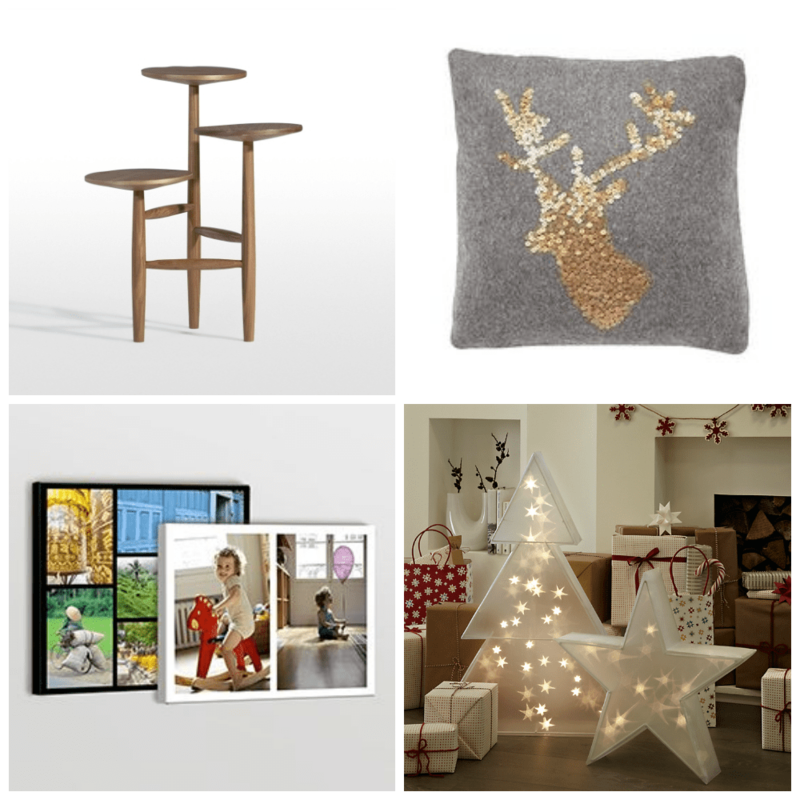 The ‘theme’ is ‘Update your Home for Christmas’ and all of the items here would make wonderful additions to your home as you prepare for the Festive Season. I know lots of people like to make their home feel extra special and so with that in mind, I have discussed which products would be most suitable to include. I’m sure you’ll agree it’s a lovely bundle of gorgeous goodies that will help your home look fabulous this Christmas. 1. 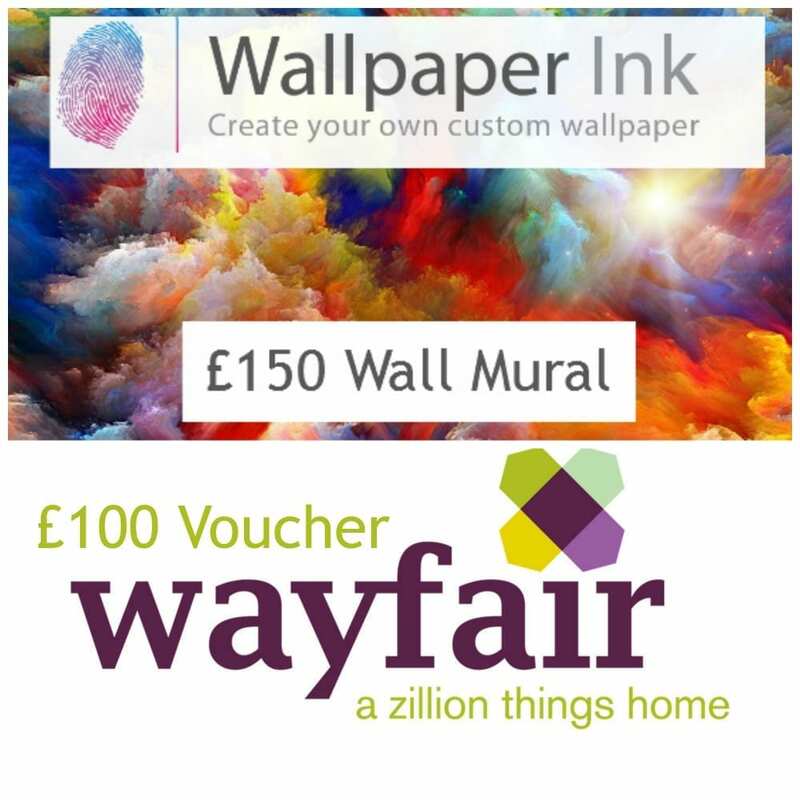 WallpaperInk have offered £150 to spend on their site where you can work with them to create your own wallpaper mural. This prize would give you a mural of approximately 3m x 2m. 2. Wayfair.co.uk sell pretty much anything and everything for the home with an exhaustive range. They’ve given us a fabulous £100 to spend on their site so get over there and get looking. 3. I just love made.com and I hope you do too. Made have offered us this gorgeous retro styled tripod table worth £99 which would be great for your sherry and mince pie. They’ve a great range of bits for under £100 this Christmas so do take a look. 4. I’m sure you’ve noticed there are plenty of stags in the bundle. This stag cushion worth £22 is from the lovely Debenhams home range. 5. Photobox is the place to go when you want to turn your photos into amazing wall art. This brand new, contemporary wall collage canvas would look stunning on your walls. Sizes vary with the largest costing £78. 6. Of course we had to include some sparkly Christmas decorations, and John Lewis in Nottingham have donated with wonderful indoor holographic tree light worth £35. I’ve seen it in the flesh and it’s gorgeous! 8. The Kenneth Turner Stag Tealight Gift set from Amara is worth £60 and includes a winter berries selection of tea lights as well as the two stunning Stags. 9. Deckchairstripes have this wonderful retro Vintage Travel cushion worth £45 that will look amazing in any home. If you love stripes their website is a must. 10. Fab.com have also donated this very cute Christmas Wall Decal ideal for all the little people in the house. 11. 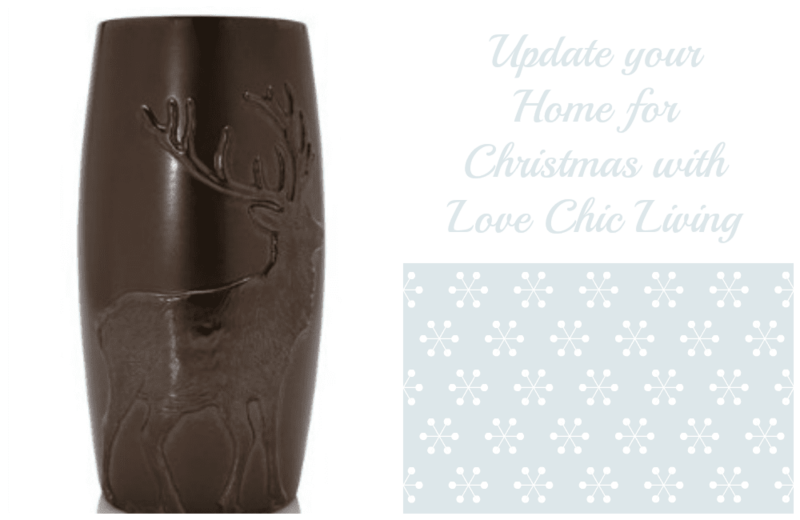 More Stags in this lovely stylish Stag Vase from Next worth £24. It’s a great addition to any room in your home this Christmas and will co-ordinate wonderfully with other prizes in the bundle. 12. 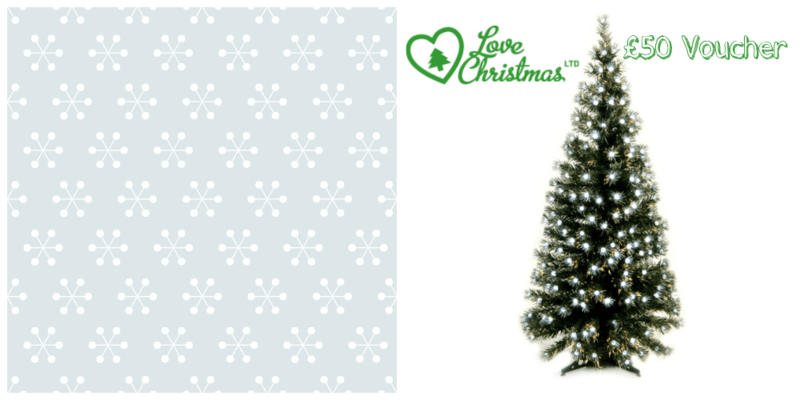 And finally £50 to spend at the lovely seasonal website LoveChristmasLtd. If you need a new tree, some new decorations or a new Christmas wreath for the door this is the place to go. I would like to say a huge thank you to all of the companies who have donated prizes for this wonderful Giveaway! 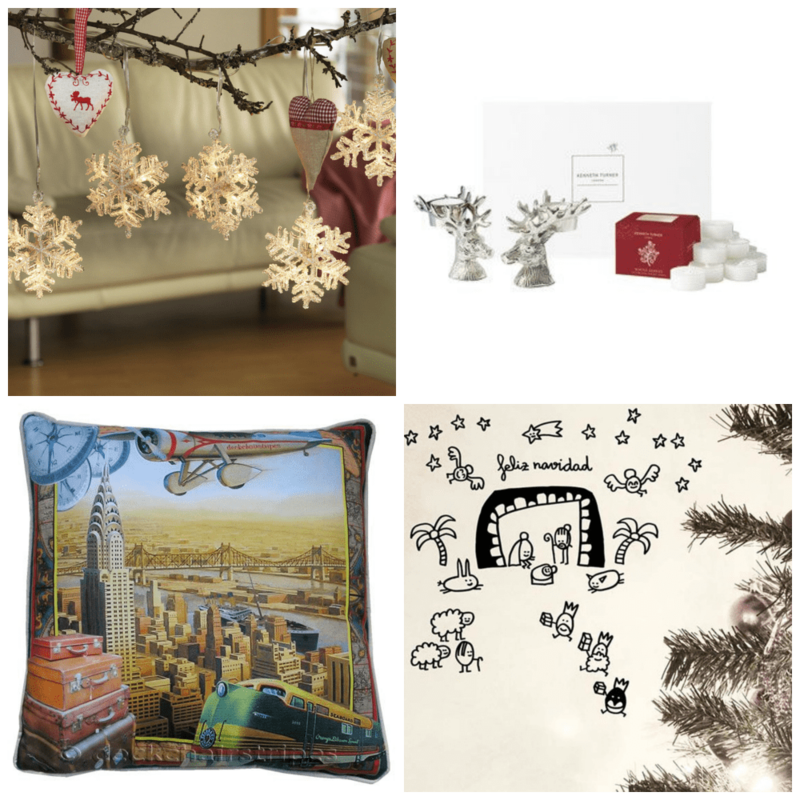 The prize is a Home and Christmas Bundle worth upto £699. There is no cash alternative. Entrants must follow the Rafflecopter instructions with upto 5 entries per person. Competition closes on 6th December 2013 12am. The Winner will be chosen by rafflecopter and contacted within the following week. The prize will be given direct from all of the different companies involved in the Giveaway. Love Chic Living reserves the right to change or alter the set of prizes should it be necessary. I have four little ones who believe in father Christmas so I love the magic of Christmas! I love talking about Father Christmas and seeing my kids faces light up! It is magical! I love the transformation of my home, making my home really christmassy! Then its all bout my kids and family, best way to say I love them! I love the magical excitement about it – there isn’t a specific ‘thing’ that I love just the air of excitement! Aside from your giveaway? I love making my house all twinkly and colourful and snuggling up with my family. My favourite thing has to be the atmosphere that excited feeling that there is a crackle of magic in the air, also usually there’s an New Agatha Christie programme on, there’s tons of nice food and you can be lazy and not feel guilty. I love the Christmas traditions that we have as a family; Decorating the tree, church on Xmas Eve, family get togethers, silly games. I love it all! I love the decorating! And most of all love that the kids get daddy home for a few days in a row without him worrying about work! My favourite thing is spending time with the family! I love the excitement of wrapping the presents and guessing what the kids will say/do when they open the present. I love the smell of all the Christmas things ( tree, candles mince pies roast dinner cooking) its on of my favourite times of the year. getting everyone together for food and drink and spending time being cosy. I like Christmas TV – family Christmas specials and the like. My family live all over the place so Christmas is the only time we all get together. Having all the family at home! The magic of christmas to me is in my grandaughters eyes, the innocence of believeing in santa, watching them in their christmas plays, the homemade cards & decorations i’ll treasure forever. After losing my son in an RTA i never thought i’d be able to feel the magic again, but my grandaughter has given me the best gift – the magic of christmas again. Food and being at home! What a wonderful competition. As I am a huge christmas fan there was no way I was missing out on this! Having all of the family together, so rare these days but always at Christmas. Seeing my son’s face light up when he sees Santa has eaten the mince pie he’s left out and drunk the milk! The look on my little boys’ faces when they realise that Santa has been then playing with their presents throughout the day. Christmas equals family in our house. My favourite thing about Christmas is watching the joy in my son’s eyes as he drinks in the magical feeling of this wonderous holiday. The magical qualities, real or imagined, that restore hope for the future and bring light and goodwill into our homes. Getting to snuggle up with my other half, surrounded by candles and comforting warm Christmas things – preferably with a mince pie and a hot chocolate! The full christmas dinner! it takes a while but i really enjoy it and i love it afterwards when we sit together to watch the film thats on the tv. Seeing the children’s faces on Christmas morning. Spending quality time with my family – making memories! Seeing my three beautiful children opening their presents, watching the excitement when opening each parcel. Oh putting up the tree and the cheesy tunes! I like going to midnight mass on Christmas Eve I just love seeing the church with the nativity all set out and the carols. Then coming home to a hotpot supper with the family and opening one present before going to bed. Everything! It’s my favourite time of year I love decorating baking, shopping, the weather, giving presents, spending time with all the people I love!!!! The light! No… not the lack of light outside, but the warm glow from the Christmas tree. Always makes me so sad taking down the decorations in January… makes everything look so gloomy! Has to be dinner on the big day with all the trimmings, followed by staggering to the sofa and collapsing afterwards! I love eeryone getting up early and seeing my lovely family opening their presents. I love Christmas TV! The films especially. Watching my children climb inside the boxes their presents came in! Getting all the decs out and making the house look sparkly, and the look on the little one’s faces, and all the fun. Our smallest will be one a few days before Christmas, so it’s even more special, and her big sister will be 5 a few days after! Very exciting! The look on peoples faces when I get their presents right. Priceless. my favourite thing about Christmas is being with my family and being off work. It is the only time of the year I eat goose and I love it. the best part of Christmas for me is seeing my grandchildrens faces when they discover that santa has been! My favourite thing about Christmas is the magic of Santa with small kids! I just love to be with my family. My favourite thing is that everyone makes a special effort to be together and let themselves go! The hustle and bustle, making sure that everything is as perfect as it’s going to be for the big day, then spending the day with all my wonderful family. My favorite thing about Christmas is Christmas Eve – all the excitement, games, buffet food and wine! I love fairy lights in every room for when its dark, with the anticipation of whats in the presents under the tree. The lovely smell of real Christmas trees – reminds me of walking in the woods in the summer. Having all the family together. Everything, Christmas is the most magical time of the year! My favourite thing about Christmas is when we all sit down together on Christmas Eve to have our first full Christmas meal by candlelight. We started doing this when the children were tiny so I could enjoy Christmas morning without worrying about the turkey and now it is a family tradition. There is such a great feeling of anticipation. I love the build up to Christmas and then to have all the family together on Xmas Day. We carry on some of the traditions that we have done since my children were little. They still have their presents in a pillowcase, even though they are over 40!! All the family gathered on Christmas Day. My favourite thing about christmas is all the cheesy music!! My favourite thing about Christmas is spending proper time with family, everyone plays games and chats, rather than rushing around doing day-to-day chores. The lights-Christmas trees, fairy lights, decorations around the shops and outside. It always feels magical, no matter how old you get. The excuse to drink gin for a whole week! I love the look on my children’s faces: when they ‘meet’ Santa, when they go to bed on Christmas Eve, when they see what’s under the tree on Christmas morning. The joy of Christmas is in their faces. I love watching my son open all his presents – and I love the food! The excitement that starts to build the day after putting up your decorations and coming downstairs to them in the morning. Candles aglow, winter snow, children’s eyes that shine, a glass of mulled wine. I love the looks on the childrens faces when the decorations go up with the twinkly lights and their excitement on christmas eve. Amazing giveaway thank you! I love rememberinghow magical Christmas was when I was a child, and then trying to make it the same when my daughter was little. Priceless memories. Wrapping the presents and then giving them out,I can never wait to give my presents! getting the christmas tree up and decorated. I love putting the decorations up and making a few new ones each year too. You can eat as much as you like guilty free! I love having the family together and spending the day in my pyjamas! the excitement before Christmas the build up and magic that the kids bring love to watch their little faces at the lights and the trees and of course when they open their presents!!!! Decorating the tree and switching the lights on. I love spending time with the family and just snuggling up in warm PJs and hot chocolate. seeing the kids faces on Christmas morning! The Candlelight service on Christmas Eve. Being cosy at home with my family. Just love Christmas stockings – still do them for my mum and husband and still hope to get one. I love everything about Christmas. I can’t wait to put up my decorations, I’ve already starting buying prezzies and I love a having all my family and my husbands family over for Christmas Day so I can pamper them all with food and drink. For me,its not about the gifts, its about enjoying time with those people at matter the most to you whilst enjoying the little luxuries you might not get to have the rest of the year. Some festive decorations would get me in the spirit, although November is a bit early to put them up! Spending quality time with friends and family. Plus all the food is nice. I find those things and give them what they have always wanted! Its my sons birthday on christmas day so its a double celebration, its really busy and tiring but totally worth it to see his face when he comes downstairs to find present mountain, seriously you can see it from space! Instead of everyone spending loads of money on presents, the family each buy three gifts worth less than 10 pounds. And on Christmas day we play a vicious dice game to win them. I love thinking up cheap gifts, and the game is huge fun! Definitely my favourite thing about Christmas. The sound of laughter, the sight of twinkling lights, the smell of roast turkey and the taste of chocolate all in one day! Christmas Dinner with all the family round is the highlight for me. All the excitement on Christmas Eve! I just LOVE having the whole house decorated with xmas stuff…too much is not enough !!!! BAH HUMBUG to those who disagree !!! My kids love it and now grandkids love it, so I must be doing the right thing…..I always drift back into my childhood when Xmas comes around …..MERRY CHRISTMAS TO YOU ALL !! The excitement of unpacking the Reindeers and putting them all round the house. Mince pies and mulled wine on Christmas Eve is my favourite thing ever! Watching others open their presents 🙂 And then Xmas lunch! The excitement and anticipation on Christmas Eve with all of us getting excited about the big man’s arrival. I love preparing for Christmas, thinking about what presents to give family and friends and celebrating Christmas with family and watching our two young grand children open their presents. This is such a wonderful prize – I just had to enter – fingers crossed! the anticipation of christmas eve! I love spending time with my family and I love the food! The magic in my sons eyes! Being with the whole family and no work! I love all the beautiful twinkling decorations! My wife’s birthday on Christmas Day. Christmas lunch with the family. Choosing the perfect Christmas tree & proudly taking it home to decorate + spending time in the comfort of good friends & family. seeing my little girls face when she see’s the christmas tree and how magical Christmas is for her at three years old! Really makes Christmas special! I love everything, cannot wait to see the lights and spend time with my family and friends. watching my kds open there presents. I love having time off work, catching up with friends and family, and recharging my batteries before the new year. My favourite thing about Christmas is having all the family at home. Christmas roast all the trimmings! More time to spend with family and friends, parties and the pure joy of the kids on Xmas morning when they see Santa has been. Family, friends, fireside and festivites and time to enjoy them. My husband’s Cinnamon Mince Pies ! Love the spirit of love, happines and sharing food with family. It should last all year. Happy Xmas everyone! I love the preparation, I do all my shopping early then take my time over wrapping the mountain of presents we have to buy. Then seeing my son’s face on Christmas day is just perfect. Love bacon sandwiches with champagne, on Christmas morning as we open all the presents. Seeing all my family together. I love the build up to Christmas, Family time, eating, playing, loving each other and the look on my grandkids faces. I love seeing my childrens faces light up when we get the tree fully decorated and switch on the lights !! xmas day – opening pressies, trying to cook the dinner so everything is ready on time, cramming everyone around the table, relaxing after dinner, queens speech and most importantly opening the big tin of chocs! Spending time with my loved ones, oh & sweets! All the family together. The kids excitement of Santa’s arrival! All the family together celebrating. The Aroma of Fresh Tree, Christmas Lunch Cooking. My favourite thing about Christmas is the celebration of the Birth of Jesus, who means so much to our family – ‘Christ’mas. Thank you for the chance to win this amazing giveaway! Drinking lots of champagne whilst eating lots of mince pies. I love everything about christmas but my favourite thing is how excited my chidren get on christmas eve and watching their faces on christmas morning when they open their pressies ( this includes my hubbie aswell lol. I can’t pinpoint just one thing I like as love ALL of it! So my ne thing if pushed would be ALL of it lol! I love the shops all decorated and the excitement from the kids. My favourite thing about Christmas is fairy lights – I just love the way they transform dark evenings! The build up to Christmas, seeing everyone prepare, the decorations going up, my daughters excitement about Santa coming and visiting him at his grotto. Wrapping all the presents whilst listening to Christmas music 🙂 its just a shame it only lasts for one day!! I love seeing all the festive decorations…. My favourite thing about Christmas is seeing and hearing the excitement and happiness of my children. If only those feelings and sounds could be bottled! All the family being together and the Christmas lights and trees. Everywhere looks so dull afterwards! My favourite thing is simply the build up….decorating the house, taking the children to meet Santa…the general magic in the air! its an excuse to eat lots of loevy food. My fave thing about Christmas is looking out f the window on Christmas Eve night to see if I can see Santa and his reindeer in the sky – I live in hope! I love the time off to spend with family and friends. I love christmas songs on the radio and singing along. I love relaxing in the evening with an open fire and the christmas lights on! This would add an extra touch of sparkle to our Christmas – I love seeing the smiles on my children’s faces as they excitedly open their stocking presents first thing on Christmas morning. Seeing the delight on my nephews’ faces and having fun playing with them! I love getting together with my family and cooking a big meal. Seeing the excitement on all the kids faces is fairly unbeatable too! My daughter’s joy at everything. We love the way everything lightens up for Christmas. Spending a few days at home with my mum and dad, I might be 26 but nothing bears being at home! Santa! my birthday is 2 days before christmas so it means double the presents! I get to spend time with my family. When I was growing up my Dad always had to work on Christmas Day as he worked for the ambulance service. Christmas is a chance to eat,and drink to excess for days-then do it all over again at New Year! I love the late night Christmas shopping and walking through town when all the decorations are up and the Christmas lights get switched on. The whole family in a good mood! Having time off with my family. I love putting up the Christmas tree. Each year we add a new decoration which symbolises something special that has happened during the year. My favourite thing about Christmas is Christmas cheer! I love wrapping all the presents! I love being able to spend time relaxing with the family and cooking a meal to remember! As my daughter will be 21 months this year I’m so excited about creating long lasting traditions with her. I like to hibernate and shut out the outside world, be with my favourite person, eat and drink my favourite things, and watch some carefully chosen films and TV boxsets. Having a fun family Christmas. Cheesy Christmas jumpers, eating loads of unhealthy food, just because it’s Christmas, Christmas films on the tv, Christmas music videos on the music channels, and of course being with your family and not being at work! Getting all of the family together, last year there were 26 of us. Sitting round the table with the whole family and having great food and drink! It used to be seeing the excitement in my children’s faces but now, it’s seeing the excitement in my grandchildren’s faces – amazing. Simply spending it with my fiancée and family. Great food and pretty average TV. Board games are always fun too! My favourite thing about Christmas has to be all the traditions – watching our favourite Christmas films in the run up to Christmas, decorating the house, coming together as a family to play games on Christmas day when we are all full of food… these are just a small few and I am so excited to start our own family traditions as Oscar grows older! Mulled wine and xmas films with the family! The magical moment my son first opens his eyes on Christmas morning and I can see in his face the exact second that he’s remembered what day it is. Nothing beats that look of absolute joy and anticipation and excitement and impatience that seems to happen in a millisecond. My DD is coming home for Xmas!! Having all the family round and watching the kids opening all their present! I love the whole Christmas period, from 1 December until Twelve Night. It is a magical time. decorating the tree, i love it. I love spending quality time with my family, enjoy great food and pplay games! It’s the time of the year when religious people aren’t quite so grasping as usual. Just having my family together for a whole day. Normally the food. However this year it will be share it as a new family. Our first baby is due on the 14th December. The lights, the tinsel, the smells all unique to Christmas. Christmas lunch and the prospect of snow! Making crafty Christmas cards and seeing people’s appreciative faces when they open them. I love sitting down after dinner – feet up – glass of wine and some nibbles – and let everyone else do the washing up! Seeing my 4 boys face light up with the magic of it all. Having all my children home at the same time, sitting around a roaring fire and opening pressies whilst drinking breakfast fizz! That there are sparkly things everywhere for a month! I love the kids happy faces and the excitement. The pretty light and the food. Yum! Love the cosy feeling Christmas brings as all the decorations start to go up and gifts start to arrive. the whole family getting together and the food! My favourite bit is the anticipation! I think that’s why I love Advent calendars so much. The look of wonder on little people’s faces when they realise Santa has been!! Seeing people’s face when they genuinely love their presents that I’ve put extra thought and care into 🙂 Lovely feeling! 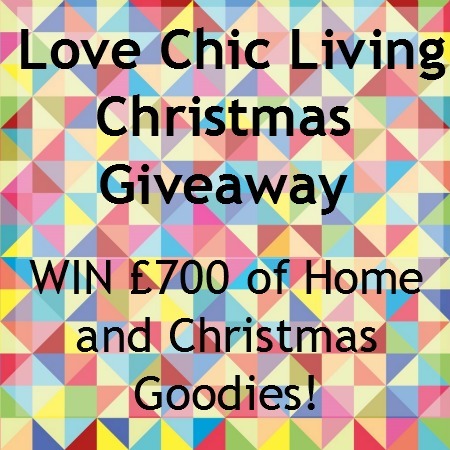 This is such an exciting give away and especially with christmas approaching! The smell of Christmas, cinnamon, oranges, mince pies, you can’ beat it. Spending time with my family, eating lots of Christmas food (and not feeling guilty about it!) and having 2 weeks off work! The German Market. Mulled Wine, Yum! My kids faces when they come downstairs and realise santa has been. I love decorating the house and getting everything looking Christmasy. I love putting up the Christmas tree, all the lights and decorations it always makes me feel Christmassy. For me, it’s making the house look so pretty and so different! The BEST part of Christmas is… Courvoisier double cream! Oh, and quality time with the family. All my grown up children and various partners coming to stay at our home, eating and playing together. Then going for a long wintry walk together. It’s not even the house they grew up in, we just like being together over this special time. I love listenning to Christmas carols on Classic FM, it gets me in the spirit every time. My favourite thing about Christmas is the food! Having a relaxing time with my family. Christmas dinner and cheesy jumpers!! Can’t wait to spend Christmas in my first ever home! Christmas Dinner! and hopefully snow outside…. I love having time to spend with my lovely family, shopping for lovely goodies and making the house look festive. FAMILY, FOOD AND FESTIVE FUN! The best thing is spending time with family, even family who do not live so close, we all make the time to get together and I cherish that. Watching my son open and play with his presents. The build up to Christmas with tunes playing on the tv; The Pogues: Fairytale Of New York. Festive spices burning in candle form as the kids choose their gifts. The night before christmas playing on DVD with logs burning on the burner. Then Christmas day comes and the meal leaves us all stuffed and ready to sleep! I love Christmas! I love Boxing Day when we all realise we made it through Christmas without any huge arguments! The magic of Christmas Eve – wrapping presents in front of the fire, watching The Snowman, laying the table for Christmas dinner the next day while listening to carols – but most of all just being with family. Being together with all the family and enjoying time with them. I love the lights and decorations, everywhere looks so pretty and the world is a much less dull place! i love the excitement of christmas Eve -when everything is done and finished and you are just excitedly waiting for christmas morning! I love the food!! It’s a great excuse for me to cook and bake and create and share with my family and friends. Food gifts are my favourite presents to give. Cooking for my loved ones! That and Xmas Dr who! Seeing my son enjoying time with his aunts, uncle & grandparents! definitely spending time with all the family. Mulled cider and music, and spending time with people. My favourite thing about Christmas is sitting down to dinner with my family, knowing that once it’s on the table, the rest of the day will run smoothly! Being with family, finding the perfect presents, exploring London at Christmas and seeing my kids’ faces light up at what Santa brought! The best thing about Christmas is seeing the children open their pressies. I love the smell of oranges…you just know it’s Christmas time when they’re around! Fave thing? family traditions, including crib service Christmas eve, dinner with family and films on boxing day. I love the excitement in the air! The good mood people are in. Also – mince pies… hot with a splash of cream. It has to be Christmas dinner with all the trimmings and all my family. This year is extra special as I have my first grandchild. Getting my family all together at Christmas! I love the way we all seem to turn back time. It’s quiet, peaceful and like the 1950’s with, central, heating and the internet! The kids have even got a xmas eve box which includes pj’s xmas dvd, some popcorn, a little drink and a teddy bear cant wait to give it to them. Fantastic prize would love to win…. How excited my kids get – it’s infectious! Love seeing my kids faces on Christmas morning. All things bright and colourful! The excitement in the air, the tinsel and the smell of turkey and Christmas pudding! Seeing my son’s face light up when he gets his christmas gifts. I like all the pre Christmas stuff – the wrapping presents, receiving cards, putting the tree up with our cats trying to climb it, and all the cooking together as a family on Christmas Eve! Choosing our Christmas tree and then decorating it. It’s a tradition that it takes a very long time indeed to find just the right tree. Then it’s trimmed with decorations that we’ve gathered from all over the world. Finally it’s topped with our Christmas ‘Furry’ a tiny model of our Golden Retriever in a fairy outfit (trust me, it’s cute). Sadly she’s no longer with us, so I always shed a tear at that moment. i love the night befre where everyone is so excited, i love making the magic come to life, and watching everyone be so happy. My fave thing about Xmas is watching the children open their stockingS! best thing bout xmas is spending the day with the people you love the most & just enjoying the moments. Getting all the family together, haven’t managed it for the last 3 Christmas’s but is set to be one bumper Christmas with everyone home this year. Will be hard work, but I’ll love every minute of it. i love walking in the snow with my husband in arms and my kids and dogs playing in front of me. Escaping the daily grind for merriment, magic and a healthy dose of alcohol. I can’t wait to treat myself to some time off work and some time off what has been a year long diet! Christmas Eve – the anticipation and build up is lovely! The time we get as a family. Singing Christmas carols with my family and the smell of Christmas trees and gingerbread. Presents! Lol. I love giving them to my family and seeing their reactiosn to things i have chosen for them. It’s the only time of the year when I have all of the family round together. Brilliant! That all the family gets together! My favourite thing about Christmas is spending time with friends and family, playing games and sharing stories and jokes. I love the smell of Christmas, the scent of the tree, candles, mulled wine and all of the goodies baking away in the oven wafting cinnamon through the house. I love it when the children open their stocking from Santa. They sit on our bed and they’re shaking with excitement. Even though it’s stupidly early in the morning!!! My favourite thing is seeing my daughter’s face and how excited she is by Christmas. She will be 3 this year, and we will also be celebrating my youngest daughter’s first christmas. Mulled wine, mince pies and spending quality time with family! catching up with family I haven’t seen since last Christmas! I love how excited my children get. I love the idea of a Christmas makeover but never actually do it, the nearest I get is moving all the furniture around to make space for the tree & gifts!!! 😉 Fingers crossed this could be the year I actually manage to do it!!! Has to be the amazing food! The best thing about christmas is always sharing it with children – my daughter is reindeer obsessed so the christmas season is always a month-long reindeer hunt! Just one thing? I love all of it! The scrummy food & hiding that expanding waistline under cosy jumpers. But my fav thing is probably family time. This is my first year in 4 years that I’ve got the day off work in 4 years! Plus my daughters very first Christmas. childrens excitement,their blind faith that Santas been!! I really enjoy decorating the tree. It usually takes me hours but I just find it so much fun and marks the start of Christmas for me. Enjoying cosy, relaxing family time around a Christmas tree decorated by my children and seeing everyone happy. I just love having all the family round about. The lead up and anticipation of the day. I love all the excitement! The laughter and smiles of the kids. I love it how my children, partner, siblings and my parents just so happy all in 1 day I just love it so much. makes me so happy. Homemade sausage rolls is the best thing about xmas!! Spending it with family but especially my grandchildren because I get to experience every joyful moment of living my youth through them. Who wouldn’t want to experience what Christmas was as a kid again themselves? There is nothing better than seeing Christmas through the eyes of a child! Seeing my boys faces when they see that father christmas has been!! I love Christmas because for that one magical day all my worries seem to disappear and my home is filled with family, joy, love and peace. Christmas is the only time of year my entire family is together. I love the bright colours of the decorations and tree. they really cheer me up when its cold and grey outside. My favourite thing about christmas is christmas eve- the excitement far outweighs the real thing! What a great prize! Fingers crossed for this! Decorating the house definitely. Our first Christmas in our new house and I find myself sitting in the evenings trying to puzzle out what should go where….or whether its a good excuse to start all over again! Watching my little boy all excited about opening his presents. I love the sparkle and shine of decorations, the excitement of my children and the chance to snuggle on the sofa with family and friends watching tv and eating lots of goodies! love having my family round and all being happy together. I love the Christmas Carols and school nativity. seeing how excited my daughter gets during the Christmas season. I love spreading Christmas magic around; whether it be by giving presents of random acts of kindness. I love spending time with my family all together! Everything! i absolutely love christmas!! Being with family, The lights, Smells, The food! I just love family time…and mince pies! Any excuse to wear glitter!!! Seeing the faces of young children, it’s priceless. The Chance of getting snow! The food. The glorious food! The food. The glorious food!!! The excited look on the kids faces,it’s just magical for them. All the family getting together. Christmas brings out the best in people! I just like the happiness and memories that Christmas can create. Children have such a hard time (in many ways although not material) these days, nothing simple. Smell of all the traditional food, and of course wating it! I love the decorations and the Christmas songs, and the way everyone seems happier. Seeing my childrens faces when they open their presents! Giving presents to people and Christmas TV. I love the precious memories that we make as a family. Not having a care in the world, having that one day to just chill and spend time with those I love. I love when my daughters get up in the mornimg and come to look under the tree. Their excitment is really special. For me it’s all about the food, the rich food…the dinner…making Christmas cake a few months beforehand…stocking up on sweets, etc. My favourite thing about Christmas is seeing my family’s faces as they open their presents! Time away from work to enjoy relaxing with the family! The kids opening their presents. Relaxing with the family and watching rubbish TV! I love all the twinkly lights that brighten up the wintry days and nights. All off us sitting down to Christmas dinner, even before the turkey is carved, the chatter and love that surrounds that table, will never be the same on any other day of the year. My favourite thing is the food! Christmas morning when my son wakes up and finds his stocking! Christmas eve! Watching It’s a wonderful life and eating and drinking with my fave people. I love the build up!! There is something in the air that you can’t quite put your finger on!! People seem happier and have a spring in their step! My favourite thing is when it Snows at christmas! I love Christmas dinner on the day, seeing the house look all Christmassy, and making homemade sausage rolls on Christmas morning! I love having fun with my 3 boys and I also love the Christmas tree. The lunch with people you get to see very often. The kids faces on Xmas morning and Xmas dinner! My favourite thing about Christmas is seeing everyone in even more good cheer and a general feeling of happiness, content and camaradery around town.